Summers beckon you to long days at the pool or beach, enjoying delectable barbeque dishes and relishing super chilled margaritas and popsicles. But the best summery joy is soaking up the warmth from the sun. While you may love the heat and your hair blowing in the summer breeze, your skin will not be very delighted with all the exposure to ultraviolet (UV) sunrays. It is true that lazing around in the sun gives you a natural dose of the sunshine vitamin, known as vitamin D. But excess exposure to the UV rays also leads to sunburn, premature skin aging, skin damage and skin cancer. Sunscreens are the most surefire solution to protect your skin, but some store-brought products contain chemicals that may actually increase the chances of skin damage or cancer. One such common ingredient is oxybenzone, which can permeate the skin and disrupt the body’s hormone system. Commercial sunscreens may also contain other nano-sized particles that can enter your bloodstream, lead to free radical production in the body and promote skin cancer growth. The perfect solution to this potential danger is to make your own sunscreen at home. Make your own DIY skin-safe sunscreen. Many natural ingredients contain properties that offer protection against the sunrays, similar to the sun protection factor (SPF) of commercial products. However, if you require broad-spectrum protection, you will need to include a nontoxic compound called zinc oxide. The particles of zinc oxide sit on the outermost layer of your skin, scattering and absorbing UVA and UVB rays, protecting the skin below. However, make sure to use uncoated, non-nano zinc oxide only. Below are the steps to make your own sunscreen at home using skin-safe ingredients that offer protection and nourishment to your skin. This homemade sunscreen will stay good for up to 6 months. 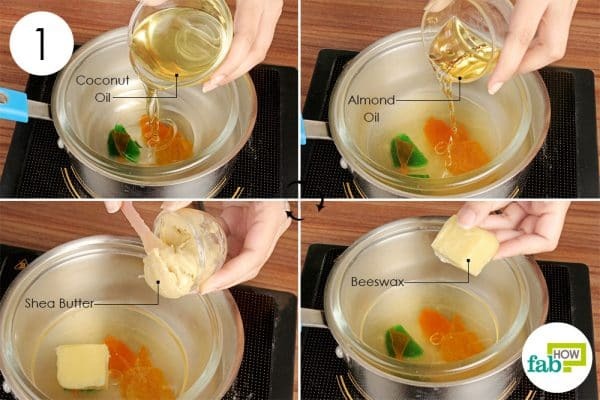 Mix beeswax and oils in a double boiler. Arrange a double boiler using a heat-resistant bowl inside a pan. Pour ½ cup each of unprocessed virgin coconut oil and almond oil into the bowl. Add 2 tablespoons each of beeswax and shea butter. You can increase the quantity of beeswax if you want the sunscreen to be thicker. Stir the ingredients until they melt and blend well, then remove it from the heat. 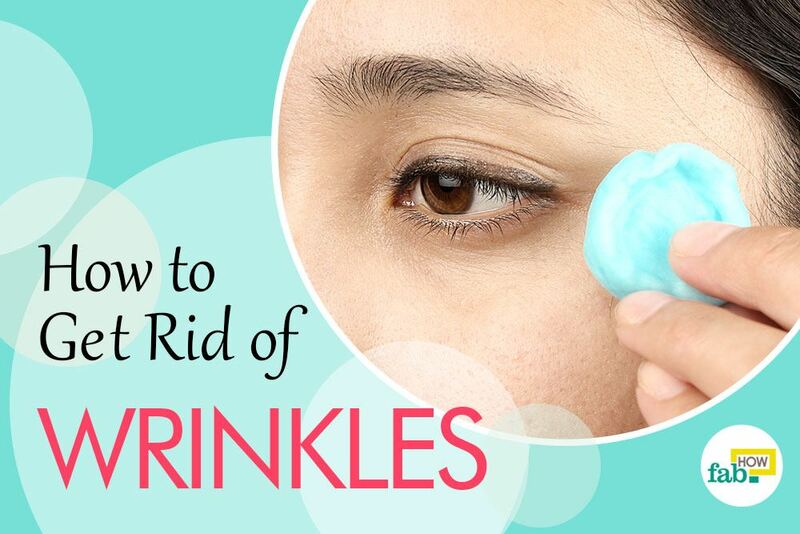 Add vitamin E oil and zinc oxide powder; mix well. Puncture 2 or 3 vitamin E capsules to get 1 teaspoon of the oil. Add it to the oil blend. Add 2 tablespoons of non-nano zinc oxide powder to the oil. 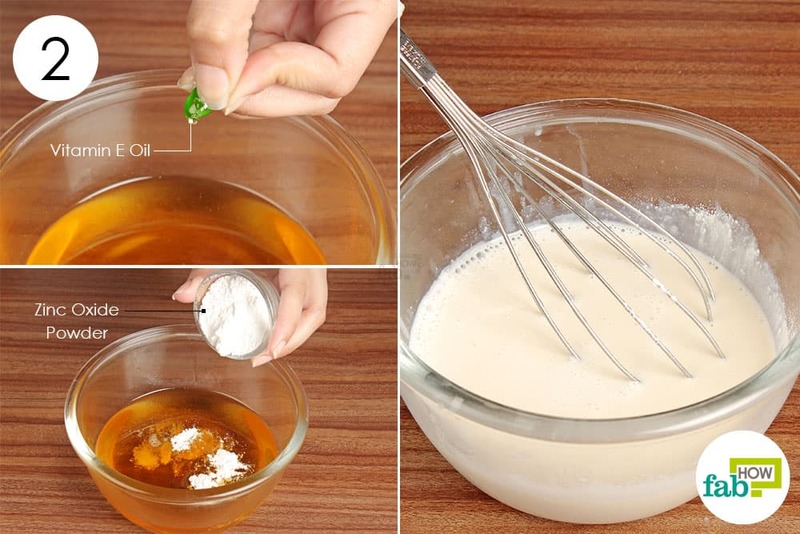 Mix well until you get a creamy-white mixture. Add the essential oils, mix and use. Add 15 drops of carrot seed oil and 10 drops of lavender oil, then give it one final whisk. Transfer it to an easy-to-use squeeze bottle and let it cool down to room temperature. Take a generous amount of this homemade sunscreen and apply it all over the exposed areas of your body before going out in the sun. Reapply every few hours, or more often if you’re swimming or sweating. Follow the above steps very carefully to make your own sunscreen at home.Refrigerate the sunscreen when you are not using it. Also, the oils used in it are photosensitive, so do not leave your homemade sunscreen out in direct sunlight. When heading to the pool or beach, keep the sunscreen in a cooler to prevent it from melting in the high summer temperatures. 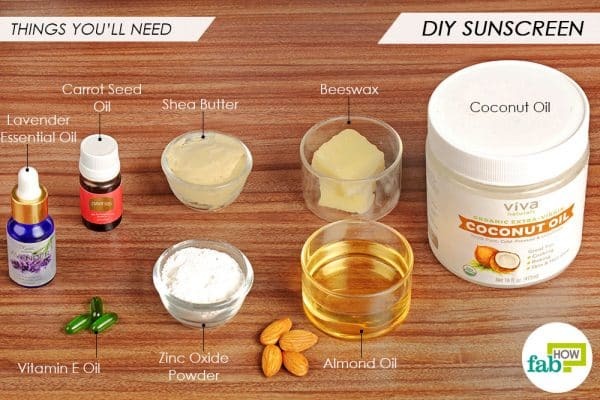 How to make DIY skin-safe sunscreen at home. As a precaution, avoid being out in the sun during the middle of the day when the rays are the hottest. If it is necessary to stay out in the sun during peak hours, try to seek shade under a tree, umbrella, etc. You can also wear a large-brimmed hat and light, loose clothing to cover exposed skin. Is there any way to know what spf this is? Thanks! 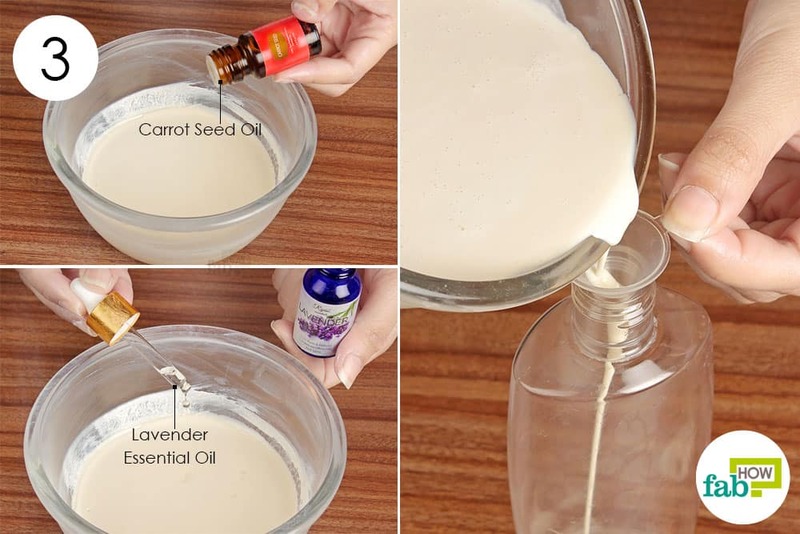 Here in the DIY sunscreen, we have used carrot seed oil for its natural SPF (35-40). Other ingredients like coconut oil, almond oil have SPF between 3-8. Keeping the ingredients in mind, the SPF would range between 35-40 only.